The machine is used for cabling the multi-core (3 to 7) plastic cables and XLPE cables. Φ1000/1+6 and Φ1250/1+6 can be used for cabling telephone cables, control cables and mineral-use cables. 1. This kide of machine has a wide range of products to suit customer's requirement. 2. 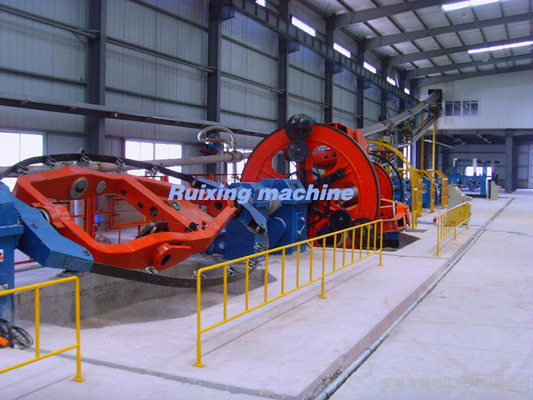 The machine can strand cables with back-twist or without back- twist. The method of retreat-spiralling: retreat-spiralling circle , planet retreat-spiralling and sprocket retreat-spiralling. 3. For the sector cables, the pre-spiraling is done by hand or motors in or out of running. Pay-off strand, stranding cartage, compact die strand, taping head for plastic tape, armoring device for steel tape, counter meter, draught device, take up and traverse device, mechanical transmission system and electrical control system.